A few years ago, when you dined out or took a cab ride with friends, you had to settle the payment with cash. Today, you might opt for Venmo, Zelle, Square Cash, or another payment app. Person-to-person (P2P) payment apps are becoming more popular and are expected to account for $240 billion worth of transactions by 2021. Business-to-business (B2B) payments represent an even larger opportunity, but payments solutions are lagging behind. A survey from the Association for Financial Professionals showed that more than half of all B2B payments—51%—are still made by paper check. Paper checks are not the most secure form of payment, and they are also not the most convenient. For these reasons, a majority of businesses are planning to switch over to digital payment options. Digital B2B payment products make it easier to make, receive, and process payments. They can also make your cash flow more predictable, which is something that every small business owner strives for. Find out more how about B2B payments work, and which are the best B2B payment products for your small business. Best for: B2B businesses that have international sellers or buyers. If you do business internationally, then you should consider Transpay, a cross-border B2B payments solution. The company supports payments to and from 200 countries in 60 currencies. When doing wire or bank transfers overseas, small business owners often incur high currency conversion fees. Transpay eliminates these fees by developing direct relationships with banks worldwide. 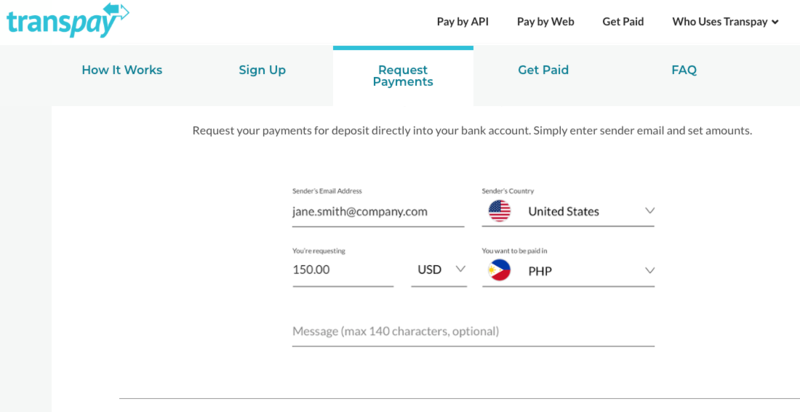 Transpay’s Pay by Web service lets you send money directly from your U.S. bank account to your recipient’s local bank account in their local currency. Their feesare 90% lower than bank wire fees and usually range from $5 to $20 per transaction. If you’re the seller, U.S.-based clients can also pay you via Transpay. You can send an email request for payment, and their payments get transferred right to your bank account without any transaction fees.